This multi-unit charger has a compact design for a smarter, more productive workspace. The interchangeable charging pockets make it a versatile and cost effective solution, allowing the user to charge batteries from two different radio platforms. It includes 6 inserts that are compatible with the CP200d, PR400, CP200XLS, CP200 and CP150. 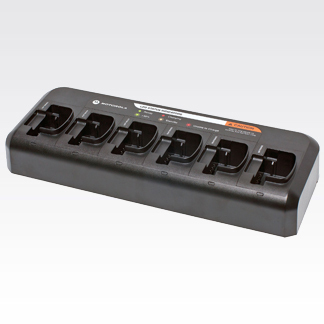 Additional inserts that support the CP185 batteries can be purchased and used with this charger.